Space Rock Squadron was the first Unity game I’ve published after a number of other prototypes and demonstrates how hard it is to name things. I’ve consistently cloned versions of Asteroids over the years. Every time I learn a new platform I create another version. I had previously written and published ‘Roid Rage to app stores and had learned a lot about the process of working with these stores through that app. In this iteration of the Asteroids theme, in addition to extending my knowledge of Unity, I attempted to make a game that varied from the rules of Asteroids. To attempt to hook the play a bit more, I did away with traditional levels and made this get harder progressively. As you destroy asteroids, replacements are created at an increasing rate. The actual growth of asteroids on the screen scales the way the original asteroids did but without a level break in between. 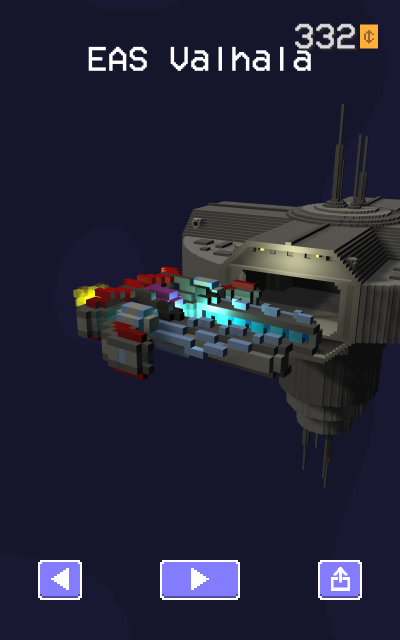 Aesthetically, I had also been playing with Voxel models and used them to give a 3D, yet 8-bit appearance. I took a lot of inspiration in this process from Crossy Road. As part of a collecting mechanic, the player can collect and play with different ships. However, not being a great modeller, I went to Freelancer and created a contest to create these ships. Best of all, on seeing my build this my son got interested and designed two of the ships for the game, for which he gets credited in game and on the web site. I then added the particle effects for the engines and bullets to bring them in to the game. This is available on iOS, Android and Windows, see https://www.spacerocksquadron.com/ for details.